Life often brings us to new phases even when we resist them or fight them or even, perhaps, when we are blissfully unaware that a new-phase is upon us. Suddenly, we may realize we cannot go back to the "old ways"...of doing or thinking. Much like a toddler who bends a knee and hesitantly scoots across a sofa and then cries out in fear when he reaches the edge, quickly realizes that while his new mode of movement is completely unfamiliar--it most definately provides more freedom the more he tries it out. As my life has moved into a new season, I have felt tempted to scoot across the couch of life, and throw a few tantrums myself as I struggled to navigate my new territory; but I am thankfully beginning to appreciate the new freedom in transition. Downtime....is essential for renewing the spirit! I am looking forward to the Christmas season and the New Year ahead....and while I may not be running at full speed....I will be moving in respect to the downtime that is now incorporated into the fullness of life. This beautiful "lit" basket was done by a friend. Such a clever idea for an entry or porch area. 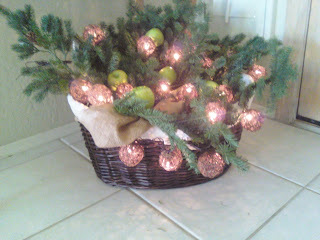 Use a great basket and fresh greenery with a battery operated strand of white lights! 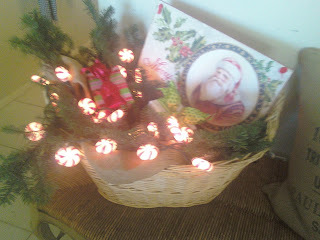 Here is another one with a vintage card using pepermint lights! Sooo cute! This is a beautiful post. Life, indeed, does have many seasons. And like nature, though the same four seasons may cycle through every year, no two are exactly alike. We will deal better with next year's winter due to the lessons we learn this winter. Wonderful ideas for decorations! Very clever.